An engaging and informative study of all the most important plants and animals mentioned in the Bible, relating the references both to Bible times and to wildlife in the Holy Land now and, where appropriate, explaining the message or symbolism behind the texts. The Prologue sets the scene by giving a simple description of the topography and climate of Israel, so that readers – wherever they are – may get a sense of what the place is like. The following two sections of the book cover first the plants, then the animals mentioned in the Bible. A wide range of plant life, including wild and cultivated trees, shrubs and herbs is covered and all creatures, great and small, from whales to ants. Mention of the flora and fauna may be used as metaphors in Jesus’ teaching or simply referred to as part of the everyday life of the time. 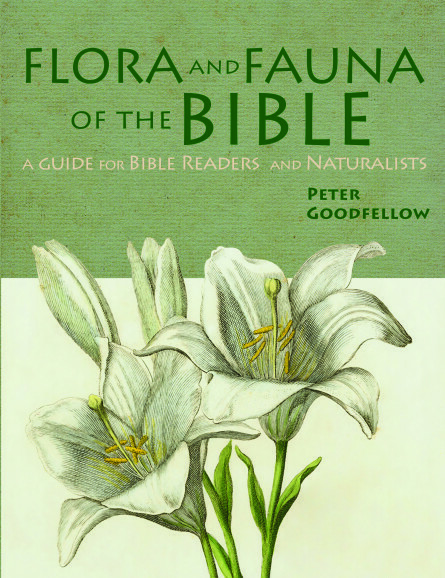 Peter Goodfellow is a Methodist Local Preacher, has been a birdwatcher and wildlife enthusiast since he was a boy, and was a teacher until he retired – he’s put all three parts of himself together in this book. He is also the author of the successful “Birds of the Bible” and a number of birdwatching guides including “Avian Architecture” which won the 2011 Prose Award from the Association of America Publishers. Specification: 228 x 175mm (9″x7″), 160 pages, 40,000 words, 80 watercolour illustrations, map.